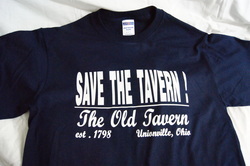 Funds from the sale of STT items will go toward the continued efforts of The Unionville Tavern Preservation Society to help Save The Tavern! We hope you will show your support! ​"Save The Tavern!" items are available at wit&whimsy located at 1940 Hubbard Road, Madison, Ohio 44057 during regular business hours. Visit wit & whimsy's Facebook page for store hours. 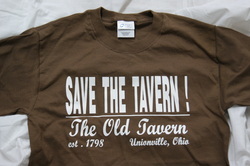 Items are also available at "Save The Tavern!" events and other community events. Please see our Events Page for more information on our events. 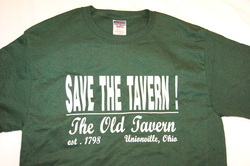 We also sell our Save The Tavern! items at local events. Check out Upcoming Events for a schedule of events.